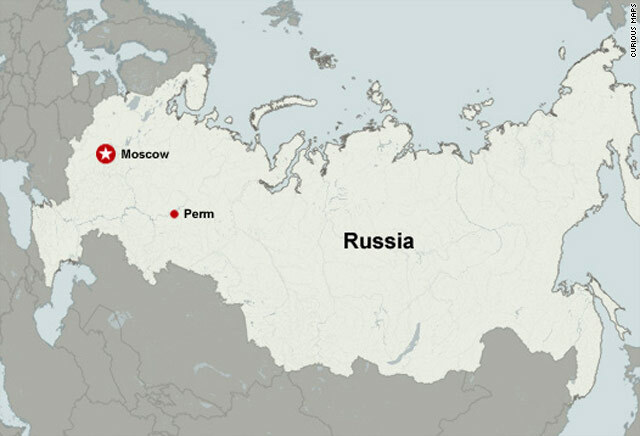 Moscow, Russia (CNN) -- Russia observed a day of mourning Monday for the victims of Friday's nightclub inferno in Perm, from which the death toll rose to 113 overnight, when a woman died of her injuries. Flags in cities nationwide were at half-staff, and national TV channels canceled entertainment programming and commercials. In the Ural Mountain-area industrial city of Perm, hundreds of people lined up to lay flowers at the doorsteps of the Lame Horse Club. Some carried photos of their relatives and friends who died in the fire. Others lit candles and cried. At noon, drivers in Perm honked their horns in unison to commemorate the victims. Russian TV reported that stores in the city that were selling fireworks, which have been blamed for the fire, were shut. 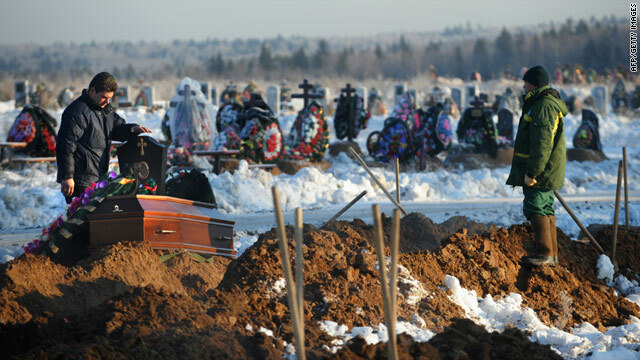 Services were held across the country and in all Perm churches, and 15 people were buried at the local cemetery, Anna Klimova, spokeswoman for the Perm governor, told CNN. In all, 123 people were hospitalized, most of them in critical condition, the Perm branch of the Russian Emergency Situations ministry said. More than a half of the injured were connected to artificial breathing devices, Russia's Health Minister Tatyana Golikova told reporters in Moscow. Nineteen of the injured remained in Perm hospitals. The others were flown over the weekend to burn trauma hospitals in St. Petersburg, Chelyabinsk, Nizhny Novgorod and Moscow, the Emergency Situations Ministry said. On Monday, Russian Prime Minister Vladimir Putin visited one such hospital in Moscow, where he met with doctors and patients. "I know that doctors are working selflessly -- without sleep and rest," he said at the hospital in remarks that were carried on national television. "Today is just that moment when you are required to go an extra mile. Everything should be done to save as many lives as possible." Law enforcement officials said the investigation was just beginning. On Monday, four people who authorities accuse of being responsible for the fire were charged after being arrested Sunday night. A fifth suspect was hospitalized in critical condition. Three of the arrestees -- the executive director of the Lame Horse Club, Svetlana Yefremova; its acting art director, Oleg Fetkulov; and its co-owner, Anatoly Zak -- are charged with "violating fire safety regulations resulting in grave hazard to health, or death of two or more people," Vladimir Markin, spokesman for the Investigative Committee of the Russian Prosecutor's Office, told CNN. The fourth person, Sergey Derbenyov, director of the company that supplied and installed the fireworks, is charged with manslaughter of two or more people, Markin said. Under the Russian Criminal Code, all four face potential prison terms of five to seven years. Investigators have determined that about seven firework devices were used in the club on Friday night. "All those charged knew they were organizing fireworks despite a ban to use such devices during large-scale public [indoor] events, but didn't exercise any caution and didn't do anything to stop those illegal actions," Markin said. About 300 people had gathered Friday night in the Lame Horse nightclub to celebrate its eighth year in business. Smoke spread rapidly, causing panic, Markin said.